Imagine you are given the opportunity to create a fantastic designed space in the Rooftop of an urban hotel. 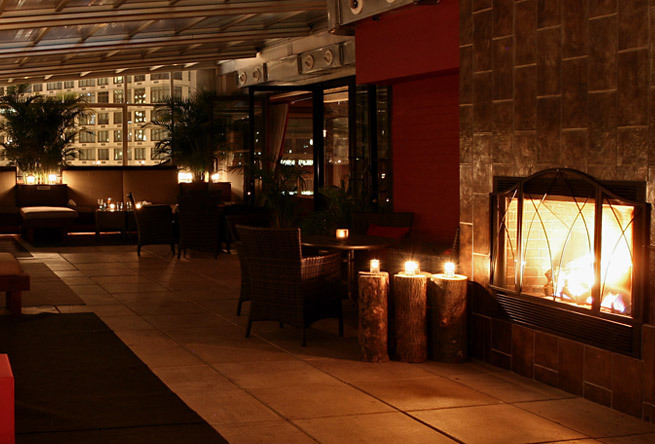 Rooftop bar, a pool side space, a patio garden, organic herb garden, glass-topped restaurant, endless possibilities. All of these examples can create the WOW factor in the guest experience in a lifestyle hotel. Lifestyle hotels around the world, including Israel, are incorporating in the design of hotel spaces the rooftop as an anchor venue that upgrades the whole overall concept of the hotel and can make a guest come back to the same hotel just because of its roof top. What can be better than a fresh outside space with great views enhanced by a hip bar, cabana style seating and bottles of colorful alcohol lined up on the railing? A great way to have both hotel guests and outside guests mingle together. There are also “green options” that create a space growing plants & tress that not only create a great atmosphere but help preserve the environment. See for yourself how rooftops can be designed as Eco-friendly not just in a hotel setting. Open space can be challenging regarding design, lighting and operations such as preparing and serving food. These challenges are worth dealing with because on the other hand, it`s a great opportunity to get away from formal and conventional settings – and in turn provide a fun filled laid back attitude and great character to a hotel. I remember my first time in a rooftop pool bar in Gavensport Hotel in the meat packing district of Manhattan. It was such a “free” feeling just hanging out with my friends over a drink or two. Today there are many hotels mostly in major cities such New York, Miami, Los Angeles. Check out Viceroy in Miami, and The Standard in New York. In Israel there is a great examples: The very in formal one is Marina Hotel in Tel Aviv who recently opened a pool bar mostly for the younger crowd. A completely different – much more formal and fancy option is in the new Mamilla Hotel in Jerusalem that introduced a bar and restaurant with a brasserie meat menu style with incredible old city views. Mamilla Hotel deserves its own post. What an amazing hotel! I find that roof top hotel design is the perfect example of how a total design approach can respect the outside just like it respects the inside! I strongly recommend checking out this article describing roof top hotels for every kind of lifestyle. I`ve stared at the picture of the Gavensport Hotel in Manhattan for 10 minutes, no exaggeration. It`s breathtaking even on the monitor. Please attach more pictures if you have available. Thankkkkk you for sharing .